loskeletal therapists, spends the bulk of his time helping some of the best long distance runners on the planet. On Saturday, the 44-year-old transplant from Flagstaff, Arizona, took a little time for himself. As little time as possible. Wharton, of Willow Hill near Waynesboro, took more than four minutes off the standing course record in the second annual MPMC 5-mile run in Mercersburg. 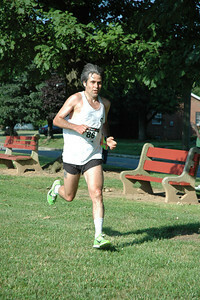 Wharton led the 47 runners and walkers to the finish line of the single-loop road race in 29 minutes and 23.3 seconds. Both he and Mike Meadows beat the previous course record of 33:30.4, set by 2011 race winner Will Rice, then 17, of Mercersburg. Meadows, 55, of Martinsburg, W.Va., placed second overall in 31:31.6 and Luke Cessna, 45, of Fort Loudon, Pa., finished third in 34:27.5. The 8 a.m. start featured a temperature of 67 degrees with no winds. It was sunny, though, on a course that is destined to become well known as much for its lack of tree cover as it is for a fast five-mile run. The hills, Wharton said of the inclines in the first and fourth miles, didn’t bother him. Wharton said the early part of the race “went pretty slow” but matched his goal of maintaining an effort of about 75 percent. Wharton said that as it is an Olympic year, he has set aside personal training goals in order to meet his professional obligations of helping some of the world’s best athletes to the starting line in London. Enjoyment is something Hope Grady also gets back in returning for her dedication to logging miles. The 45-year-old Mercersburg woman is a stay-at-home mom who, she said, uses training to pray. Grady led all female finishers to the end of the five-mile run in 35:05.7 — a mere 4.9 seconds off the course record of 35:00.8, set last year by then 14-year-old Caroline Schemel. If that’s true, practice made perfect for Grady. She earned the top spot in the women’s field by more than 90 seconds as Brooke Schellhase, 36, of Fayetteville, Pa., placed second in 36:38.2. 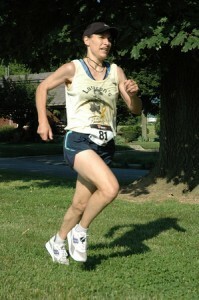 Katie Thompson, 31, of Chambersburg, Pa., finished third in 37:03.6. Though she acknowledged her training didn’t meet her personal standard to call it a race, “it’s always in my mind to run hard,” Grady said. “I’m a runner to the core,” she said. Grady said a person always on her mind is her daughter, who died at the age of 2 from brain cancer. “She’s where I want to be one day. In Heaven,” Grady said. Grady said she prays the Rosary while running. 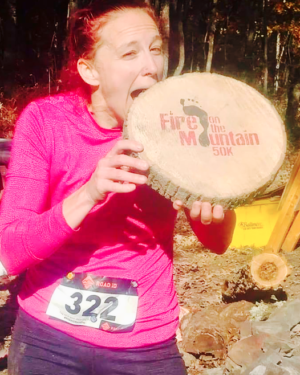 Race Director Danielle Fox, of MPMC, moved this year’s event under the banner of the Potomac Highlands Distance Club, an affiliate of the Road Runners Club of America. In addition to an increase in the number of participants to this year from last, Fox also coordinated a successful health and fitness expo on the site of the Mercersburg Lions Club Community Park.